Google announced the launch of its new browser called chrome. It will be launched in US on tuesday, thats end of the day today. 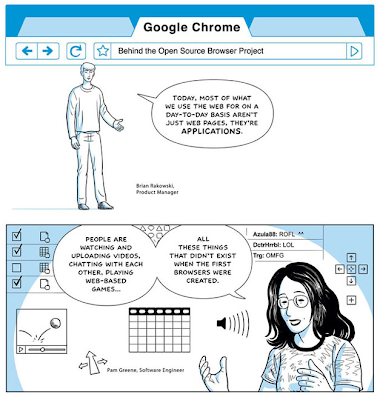 Glimps of the product was released via comic (which I think is a nice way to communicate). BTW this comic was created by Scott McCloud of classic Understanding Comics fame. Will this browser kill opera etc: Time will tell. Let’s wait and watch how good/bad is this new browser. 2-hours of browsing and I have already made up my mind – it’ll be me default browser for sometime now. The play with the new tab feature is something I found very interesting. The minimal design and neat look definitely gives it a professional look. It loads fast :). Let us know abt your experience.